The famed Szymon Chlebowski longswords are forged, hardened, (50 Rockwell Hardness Scale) and tempered with careful attention to precision detail by Mr. Chlebowski, himself, a veteran longsword fencer and one HEMA’s top competitors. 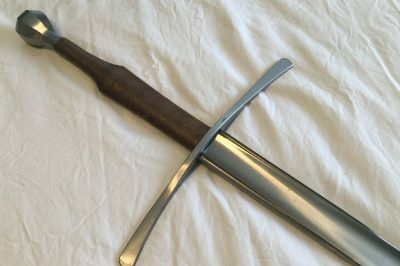 Chlebowski Longswords come with a high-polish finish and a rarely seen “finished peen” on the pommel where the pommel and tang are smoothly integrated to present a beautiful and comfortable finish. All of this is brought together with a sealed fine cord wrap over the slim and waisted grip adored by so many. Truly, a connoisseur’s training tool! Custom lengths and colored grip options are available by contacting us directly. Chlebowski Longswords are proudly made by hand in Poland using spring steel and come with a one year warranty for critical failures under normal usage.